Like the outdoors? We have 880 square miles, mostly mountainous and mostly forested. Those 880 square miles hold some wondrous rock-climbing, hiking, camping, hunting, and exploring, not to mention wildlife (black bears, cougars, elk, etc.). You can hike the Pine Mountain State Scenic Trail, also called Pine Mountain Trail State Park. Click here and here for information. Or, if your taste is for water, you can RV, camp, kayak, canoe, and fish at Fishpond Lake. (Yes, Fishpond holds fish, as the name would indicate. Word is there is some nice bass fishing there, among other varieties). Once the site of a mining camp, the valley was dammed and flooded in 1961 to create this little 895-acre gem of a lake. Click here for more information. Fishpond Lake is located at the upper end of the county near Jenkins. Or you can canoe, kayak, or fish the North Fork of the Kentucky River, which originates on Pine Mountain and flows northwest. Or mountain bike in many places. Or try mountain running. Or take advantage of our many other outdoor opportunities. Click ﻿here﻿ for specific visitor attractions. ​Prefer to take your exercise indoors? Letcher County has a beautiful modern recreation center in the county seat, Whitesburg, where you can get fit with friends, and then test your fitness against the climbing wall. For hours, amenities, and other information about the recreation center, click here. ​Interested in History? We may not be Europe (for one thing,m we have more varieties of trees), but we have history going back past the Revolutionary War. Setting aside native Americans, there's a chance Hernando DeSoto may have passed through the area, if he got this far north on his 1540 Expedition. Other early adventurers roamed this area as far back as the early 1700s. Permanent European settlement came a little later. Most of the earliest settlers in this area took up Revolutionary War grants. Some had to try a few times before they could hang on against the native Americans and nature, but they eventually prevailed. A lot of the land records today trace back to those grants. More modern boundaries tend to follow ridges and valleys, but if you see a deed with a long straight boundary that ignores topography, it's likely one established by those grants. Because there was a natural gap in the Cumberlands (a gap is a pass through the mountain ridges; the name will be familiar because of Cumberland Gap) between what is now Pound, Virginia and Jenkins, Kentucky, pre-and early-Kentucky-settlement days saw a lot of movement by Indians coming from west of the Appalachians to attack the settlements in southwest Virginia through Pound gap. One of those who used it was a native called Benge, who knew the territory well and took advantage of that knowledge, traveling between North Caroline/Tennessee and Virginia, and crossing Eastern Kentucky in the process. I don't believe we have a monument to Benge here in Letcher County, but just across the line in Wise, Virginia, there is a marker on US Route 23 to those days and those attacks. Besides Indian/settler clashes, Pound Gap also saw a lot of Civil War activity. More of that elsewhere on the site. 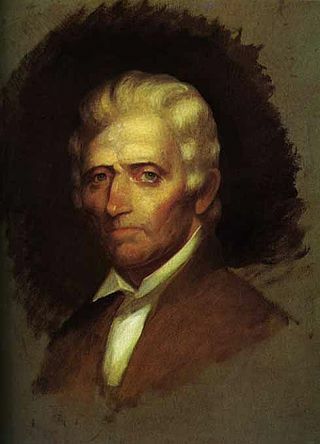 We would like to claim Daniel Boone, and he certainly traveled this area (he was all over the place in the eastern half of Kentucky, so we can legitimately assert a claim), but alas he moved on to the Bluegrass to establish his fort.) In this area, he lost a son to an Indian attack (the party had separated for camping, making them more vulnerable) just across the line in Virginia while he was putting together an expedition that would have brought the group through here. We don't know if Benge was involved in that. What we can claim is historic Appalachian log cabins. They are dotted here and there all over the county, and some of them are still occupied. One of those still-occupied cabins - a two-story one made of enormous poplar logs - was built by an early settler named Bates on Elk Creek in the lower end of the county. One of the descendants of the original builder lives in the house. Another cabin of particular historic note is the dogtrot cabin lived in by William Cornett, a Revolutionary War soldier one of the early settlers in Letcher County. (A dogtrot cabin is essentially two buildings separated by an open air "hallway" between the two and covered by a common roof. That cabin sits in the Line Fork area, and is still lived in. William Cornett's 1825 grave is nearby and open to visitors. When William lived in that cabin, Letcher County was still part of Perry County. When they separated in the eighteen-forties, the cabin and gravesite fell on the other side of the line by a bit, but there are Cornetts all over Letcher County and they likely all descend from William or his brother Samuel. Old Appalachian log cabins can quickly be distinguished from modern log houses and Scandinavian log cabins by the chinking between the logs. We don't know if we have more of those cabins than anyone else, but we know we have a lot and we cherish every one of them. More History: There are historic markers here and there around the county, but a lot of the history is not documented by signs. Click here for an area or two you might want to check out. ​The fighting was fierce here. Local battle numbers were small, generally, but vicious as only brother-on-brother warfare can be, often one-on-one, consisting to a large extent of bushwhacking from cover, and fostering feuds that lived on decades after the war was over. Letcher County raised a Confederate unit, and several surrounding counties leaned toward the Union. Occasionally raiders from the other side would come into Whitesburg and burn some houses, or the locals might retaliate, and there was an occasional pitched battle as well. 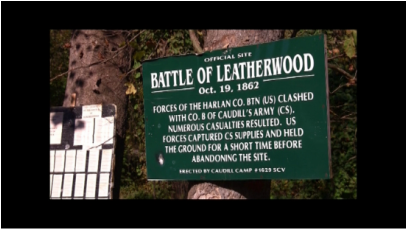 Local re-enactors sometimes restage the Battle of Whitesburg, but every year Letcher County re-enactors relive the battle of Leatherwood, a salt works just over the county line in Perry County that was fought over, salt being a valuable commodity in Civil War times. Click here for a few Civil War sites. Or maybe you’re an aficionado of historic graveyards? We have those here as well, and we cherish them. One of the primary distinctions of Appalachians is that most of us know where we’ll likely be buried, no matter how far we wander. 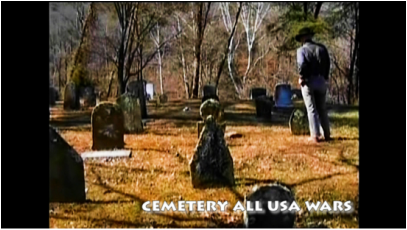 That’s because most families in Letcher County still have family graveyards, and we still turn out on “Decoration Day” to clean and adorn them. Click here for more information. Seeking a place to worship? We mostly follow Christianity here in Letcher County. It would even be fair to say that we’re mostly Protestant. although the influx of Europeans to the coal mines assured that we do have Catholic Churches. But when we invest in religion, we don't stint, especially in number of churches. While the south leads the nation at 15.4 churches for every ten thousand residents, Letcher County far exceeds even that. While definitive numbers are hard to come by, our estimated 2015 population of about 23,000 supports at least sixty-seven churches, perhaps substantially more, for a ratio roughly double that of the religiously-inclined south. That means a lot of churches to attend or to tour. ​For instance, you can visit a magnificent Presbyterian stone church built by Italian craftsmen near the turn of the last century. Located downhill from the courthouse toward the river in Whitesburg, Graham Memorial Presbyterian Church is worth visiting just for the permanent tribute the craftsmen left to their origins by incorporating into the masonry work a stone in the shape of Italy. It's cherished now, but around the time of World War II it was the source of some controversy. Click here for the story of the World War II "Battle of the Boot." The builders of the church also built some lovely stone bridges. Or visit the Methodist Church in downtown Jenkins, a coal town established in 1912. That church, now more than a hundred years old, boasts beautiful stained-glass windows ordered from Italy by the head of Beth Elkhorn Coal Company to grace the main sanctuary when the church was built. 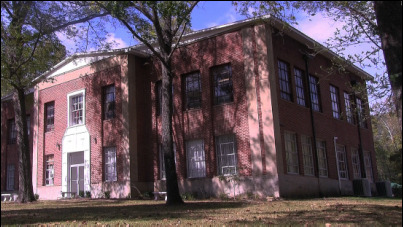 Or visit a Presbyterian Mission campus established more than a century ago that functioned as both a day school and a boarding school to educate the children of the Kentucky mountains when schooling was a rare and desirable commodity for mountaineers. The campus was largely self-supporting in that it grew its own food, and the students helped pay for their education by their work. After the county built a public high school in the lower end of the county, Stuart Robinson had a second life as Calvary College. It now has a third life as Calvary Campus, a retreat for religious officials and a center for county activities year round. In the days when it was still a high school, Stuart Robinson graduated some distinguished people. Gurney Norman, a well-known writer and a former poet-laureate of Kentucky, was a boarding student there. Baxter Jenkins was a prominent official in Alaska during its territorial days. Dr. Juanita Kreps, President Carter's Secretary of Commerce, matriculated there before going on to greater things. And there are many more from this tiny mission school who distinguished themselves in war and peace. One of the interesting features of Calvary Campus is that the old Teacherage, which once held living quarters for faculty, has taken on a new life. Some of the apartments have been converted to suites consisting of a combined living room, dining room, and full kitchen, a separate bedroom, and a bath. Furthermore, the last time a friend stayed there, you could get all this for an amazingly low price. If you're thinking of taking advantage of the suites, check with Calvary for the price You can reach the campus at 606-633-9300 or by email at calvarycampus2003@gmail.com. ​For more information about its current form as Calvary Campus and for beautiful photos of its extensive campus, click here. Besides the plethora of churches to visit, there are three religious establishments in the county that are nearly unique. One of those religious establishments is one of Mother Teresa's missions. Mother Teresa visited Letcher County more than once. During one of those visits, she established a mission in Jenkins Kentucky, where four sisters live and work to help the poor, homeless, and ill. The sisters, in accordance with their vows, shun publicity, but if you go to their mission buildings in Jenkins, you may catch a glimpse of them in their white dresses with blue trimmings as they go about their missions of mercy. The second is the Old Indian Bottom Church, which was established in 1810, very soon after settlement took hold in the Eastern Kentucky wilderness. The church was built for the worship services of Old Regular Baptists (see more just below). The original church building had to be replaced, but the current building is still more than 100 years old, and is on the National Register of historic places. The current building is reminiscent of New England spired chapels, and sits on a wooded hillside. It is no longer used for regular worship, having been replaced by a newer building, but it remains available for special occasions. It was heated by a potbellied coal stove which is still in use, as are the original pews. The original outhouses, which the builders may have called necessaries in the Colonial manner, are still there, but the hitching rails to which worshippers who did not use shanks mare once tethered their mules and horses are no longer there. The third religious establishment of distinction is the Old Regular Baptists themselves, a denomination very prevalent in this area but very uncommon elsewhere, although there are a few congregations supporting expatriates from this region to Ohio and other nearby states. For a feel for the traditions of the Old Regular Baptists, go to one or more of the simple Old Regular Baptist churches, many of which hold services only one Sunday a month, in the manner of the old circuit-riding preachers. If possible, attend an old Regular Baptist pre-funeral visitation (what we used to call a wake) one night, or even a day-time service, and feel yourself transported back to the time of Oliver Cromwell. The Old Regular Baptists are a small group in the religious structure of this country, but a distinguished one. Their congregational strength may not match that of the Southern Baptist Association, but then Southern Baptists don’t have those links to the ancient past either, and as far as we know don’t have their services and singing collected by and archived at the Library of Congress and the Smithsonian. For more information about Old Regular Baptists and their churches, click here. Like traditional music? Authentic bluegrass? Banjo expertise? 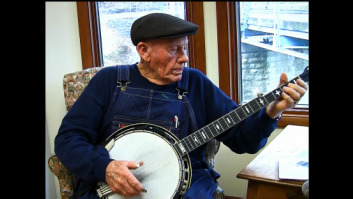 Lee Sexton, a Letcher County resident who is in his eighties, was asked by the Smithsonian to record, for their archives, 100 of his banjo tunes (which Lee calls “banjer” tunes, and if anyone should know how to pronounce banjo outside Earl Scruggs, it’s Lee Sexton). Lee lives on the west (lower) end of Letcher County, but plays all over the continent. Look for a PBS special on Lee. ​​Heard of Bill and Charlie Monroe? 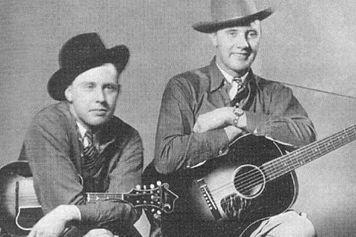 Our rural schoolhouses hosted Bill Monroe decades ago when he and his brother Charlie played in our local venues, long before Bill became famous and was taken up by places like Carnegie Hall. Talk to old timers here who remember paying maybe a quarter to hear Bill or Charlie. One of Letcher County’s own, Kenny Baker, was Bill Monroe’s fiddler for many years. Kenny died not that long ago, and you can still run into Letcher Countians, especially up around Jenkins where Kenny was raised, who ran around with Kenny and can attest to both his musical talent and his toughness in a fight. Click here for a funny story about Lee Sexton, Kenny Baker, and Marion Sumner, another great Letcher County fiddler. Or perhaps you know of Martha Carson, who had a huge gospel hit with the song Satisfied? Martha sprang from the city of Neon in the upper end of Letcher County. Like Bill, she was an early member of the Grand Old Opry, along with her husband James. Once at the crossing, walk a hundred yards further downriver from the lower crossing along the railroad he drove (or drive parallel Jefferson street) and you’ll come to the prettiest little town park you’ll ever see. Blackey has a couple of other musical distinctions. Bobby Bare (Detroit City) lived here for a while when he was young. And it may be the only town its size to have several songs written about it. Dolly Parton had a big hit with her song Blackey, One of our local singers, Will Caudill, wrote another that locals argue matches Dolly’s. And there’s at least a third. Blackey clearly inspires creativity. Or maybe you'd like to attend the oldest running square dance in the country? Just up the mountain from Blackey lies Carcassone. The locals hold a square dance at the Carcassone Community Center (which started as the Carcassone school nearly a hundred years ago) every two weeks from around April into November. It's said to be the oldest running square dance in the country, and it draws an enthusiastic crowd, from dancers to kibitzers to the musicians who play for the dance and the person who calls it. Carcassone also has a Wednesday morning quilting group. Quilting groups used to be common in Appalachia, but are fading, so we cherish the Carcassone quilters. ​For more information about the Carcassone Community Center, its history, and its activities, click here. But whether it’s Lee's banjo tunes, Bill’s songs, Loretta’s, Dolly’s, or those by local composers, Letcher County rings year-round with mountain music. For some local sites and festivals where you can hear it played, click here.